Home » What is Nia? From the moment you step through the door, you know that your relationship to your body and your experience of life is about to change forever. In Swahili Nia means “with purpose” – and that is how Nia teaches people to move. It is a path to condition, heal and express yourself though movement and sensation. 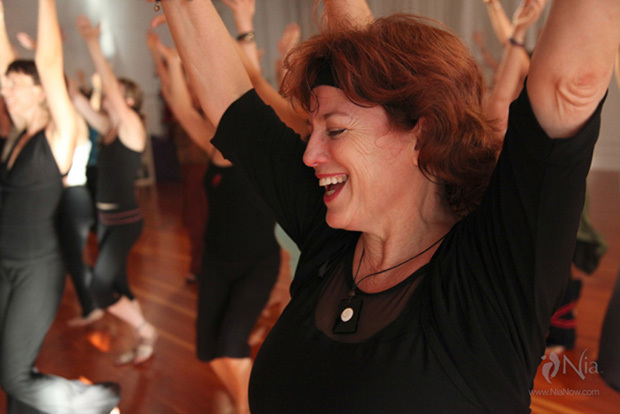 Nia is a fusion fitness – a dynamic blend of the dance arts, martial arts and the healing arts. It creatively integrates the mindfulness of the martial arts and meditative techniques, the grace and fluidity of the dance techniques, and the awareness and alignment of integrative body therapies. 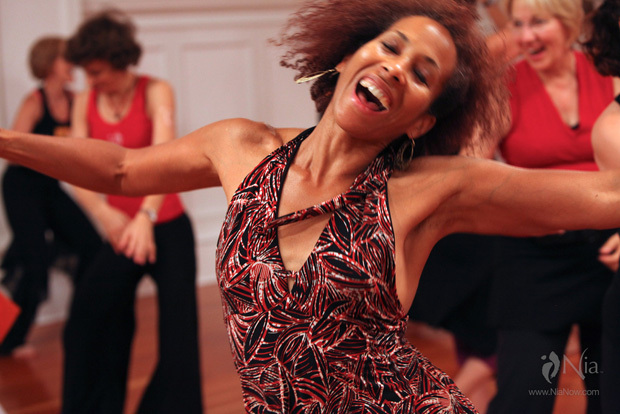 Balancing technical precision with free-form expression, Nia brings the body, mind, emotions and spirit to optimum health though music, movement and self-expression, guided by the sensation of Pleasure. By addressing the whole person, movement becomes self-empowering fostering personal growth and well being. Nia teaches individuals how to physically interpret and internally direct their actions and choices, and to listen to the voice of their body and find the quality of Dynamic Ease. Nia delivers a cardiovascular, whole-body conditioning based on creating a loving relationship with your own body as you tune into your own Body’s way – the innate intelligence of the body. Nia goes straight from the nerves to the muscles, bypassing the “thinking” brain. Movement is copied and absorbed into the body without tricky choreography or thought processes. Nia is about Action – the power of now, of continual movement in the moment. Practiced barefoot to music, Nia is self-guided, adaptable and safe for any fitness level, from reticent beginners to highly fit athletes. Most of all, Nia is exhilarating and fun! Nia is the Body’s way – a new way of being and living in your body.